It's a particularly efficient synthesis, very easy from a practical point of view. There is not any intermediate operation of purification since almost the entire reaction is carried on in just one solvent (benzene). The first two steps are simple reaction of nucleophilic substitution; 2 molecules of terbutyl alcohol displace 2 atoms of chlorine. Et3N neutralizes the hydrochloric acid (HCl) that comes from the reaction, and the salification product (Et3NH+Cl-) is easily removed via filtration (this salt is insoluble in organic solvent). Afterwards, propargylic alcohol is added; the last chlorine atom is displacet via nucleophilic substitution. 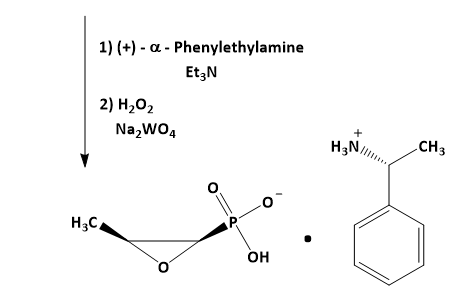 Heating up the phosphite we have just generated, riarranges to give a phosphonate, where the alkyl group of the propargyl alcohol gives at the same a particular structure called "allene" , that is quite unusually stable (also this time (Et3NH+Cl-) is easily filtrated ). The allene can be hydrogenated selectively at the terminal double bond with H2/Pd/C . Then the two terbutyl group are removed by acidification. The acidification is performed with the same phosphonic acid (organic acid) that is the product of this elimination reaction (obviously a catalytic quantitative is used to acidify). At last, enantiomerically pure phenyl-ethyl-amine is used to solve the racemate. In fact it gives a salt (unsoluble in organic solvent, ppt) just with one of the two enantiomers that results from the epoxydation. The other enantiomer gives a soluble salt with Et3N . This reagents (H2O2, Na2WO4) are used to perform peroxydations on double bonds adjacent to electron-withdrawing groups (such as PO3H-).